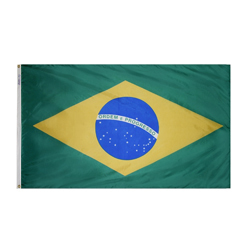 The Brazilian flag was adopted in 1889 to replace the flag of the Braganza-Habsburg dynasty. The green field and yellow rhombus from the previous flag were preserved, but the previous flags’ coat of arms was replaced with a blue circle with 27 white stars, each representing a different Brazilian state and the Federal District. The banner on the blue circle states the country’s motto: Ordem e Progresso, or Order and Progress.